Now that I know you can’t get to that ball, I’ll get it! You know they’re hitting all the balls to you because you’re the weaker player! I really don’t like playing with you! I can’t believe you just hit that ball into the net! You don’t seem to be able to hit anything at the net, why don’t you just stay back at the baseline! Why didn’t you play this bad when I played against you last week? Is your middle name unforced error? Way to go, that’s the first return you hit all day! I really hope you don’t double fault again! 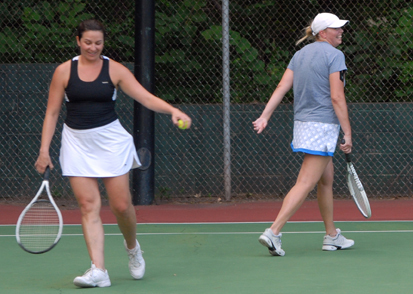 Developing a successful doubles partnership takes good communication, mutual respect and trust. If your partner is having a bad day, or struggling with part of their game, you can be sure that they are well aware of it. They don’t need you to point it out to them. A kind word goes a long way at helping your partner through the ups and downs of a tennis match. It takes two people to win in doubles, and winning is much easier if you make your partner look good. If you’d like to add a "worst comment" to the list, visit our Facebook page at http://www.facebook.com/sctennis and add your comment to the thread. What is Jr. Team Tennis? As Adult League players of all ages tie on their tennis shoes, grab their racquets, and head to the courts for a team match, they are followed by the younger footsteps of Jr. Team Tennis players—recreational tennis players ages 6-18. With an emphasis on fun, fitness, and friends, junior tennis players can now enjoy a league of their own that combines the unique challenge and sport of tennis with the educational and character-building aspect of team sports. In Jr. Team Tennis, children ages 6 to 10 use the QuickStart play format, using age-appropriate equipment and scoring that make it fun and easy for kids to learn and play the game. The minute kids pick up a racquet, they’re learning and reinforcing the fundamentals of the game—serving, rallying, and scoring—by doing, not drilling. It’s incredibly fun, so they’ll keep wanting to come back to play and learn more. Children ages 11 to 18 use a full-size court and enjoy the same emphasis on learning through play. All age divisions are broken into multiple levels of play so kids play with and against other kids of a similar age and skill level: Beginner, Intermediate or Advanced. Would you like to bring Jr. Team Tennis to your town? Take the quiz below to find out if you’re ready. 1) Do you care about the values of sportsmanship, fair play, and integrity? 2) Do you believe in the power of team sports to teach life lessons like confidence, cooperation, and responsibility? 3) Do you believe in the benefits of exercise and fresh air for kids of all ages? 4) Are you a parent, player, coach, tennis professional, P.E. teacher, school administrator, youth services organization, park, or recreation agency? If you answered YES to all four, then you are an ideal candidate to start a Jr. Team Tennis League! Now that you’re ready to start a league, there are three more questions to ask, and one phone call to make. What age divisions will you offer? This will affect what kind of equipment you’ll need and how you will market your league. Start with this simple fact: all it takes is a few courts! 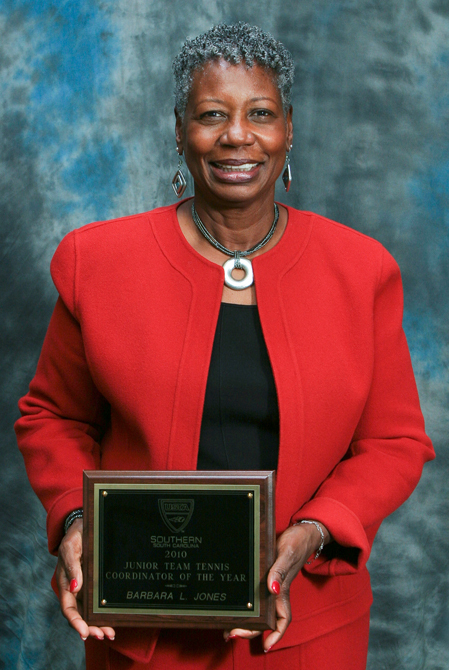 In St. George, local league coordinator and USTA SC award winner Barbara Jones found the only two courts available, and rallied her community to repair them for a now-thriving program (see USTA SCoop, 4/13/11). What time of year is right for your league’s season? This may be dependent on local school schedules and the level of play you want to offer. In the Bluffton-Beaufort-Hilton Head area, winter and summer high school leagues allow high school players to keep their tennis skills sharp between school semesters and play on co-ed teams. Jr. Team Tennis offers the ultimate flexibility in price, place, and schedule. 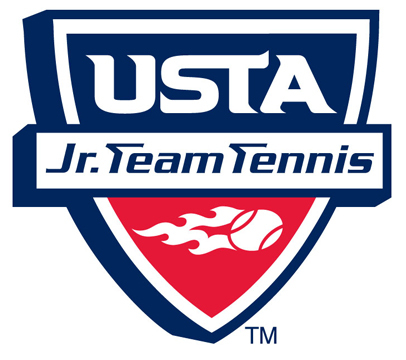 Call or email Michelle Campanella, Manager of Junior Programs at USTA SC, to start a Jr. Team Tennis league in your community. Want to sponsor, volunteer and/or enroll your child in an existing league? Contact your JTT local league coordinator here: www.sctennis.com/jtt and click "Find a Program." She holds over 26 National singles and four world singles titles and has represented the USA in international play for over 12 years. He was top 50 in the Nation as a junior, played #1 for George Washington University in college, and has been a local pro and player on the Charleston Pro League since 2005. Together, they hold 5 National Mother/Son titles, and they are preparing to compete in San Diego in early June for a 6th title. Playing mixed doubles with a mere acquaintance can be challenging, playing it with a family member can jeopardize family harmony. But somehow, the Fishburne-Hane doubles partnership not only works, but it is also one of their favorite tennis experiences. So exactly what makes this Mother-Son team of Diane Fishburne and Matt Hane work? They use the same winning combination as any successful doubles team: mutual respect, trust, a lot of laughter and a strong desire to be the best for their partner. Left-hander Matt is known for his power: big top-spin forehand, big serve. Diane, on the other hand is your worst nightmare in mixed doubles–a very strong woman with few weaknesses and intense on-court competitiveness. It’s interesting to note that when asked about each of their games, Matt emphasized Diane’s on-court strength much more than his own power game. "Normally I’d tell you that my serve is by far my biggest strength, but since I get to play with someone as good as my Mom, that doesn’t make a whole lot of difference in our matches. My biggest strength when I am playing with her is that I’m very laid back and I’m good at getting her to laugh and relax when she starts feeling tight. I tell her that she is too good to be nervous." "Her backhand and lack of any real weaknesses are her best attributes in terms of strokes, but her competitiveness is what I really notice in every match we play. It doesn’t matter if it’s the first point of the match or we’re up 6-0, 5-0, she’s focused on every point and hates to have any careless errors." Matt comments further that one of the things that makes he and his Mom such a formidable doubles team is that they lack the weak link that is almost always present in any doubles pairing. When it comes to scoping out the competition, Diane is the key scout. According to Matt, "She’s pretty much in charge of all the scouting for us. She loves to know everything about everyone we might play, so she’ll do internet searches and show up at the courts a couple of hours early so she can watch our potential opponents play." Matt and Diane both agree that he is the funnier one of the pair, and Diane the strategic thinker. Matt says, "She usually has people’s strengths and weaknesses figured out within ten minutes on court. I’ve always been a swing hard and hope for the best kind of guy, but she’ll adapt her game to any style she needs to best handle someone." Other than tennis strategy, what else do Matt and Diane talk about before and during a big match? Food and shopping! According to Diane, Matt prefers Japanese, and she prefers chicken. But then she added that she doesn’t really care what the choice is, as long as they can do some shopping afterwards. What advice does this powerhouse duo have for other parents wanting to give parent-child tennis a try? Be sure that you go into it for the right reasons: fun, a unique opportunity to spend time together, to meet new and interesting people. If you can’t laugh and have a great sense of humor about the challenges of family doubles, you will never be successful. And, according to Diane, if you are playing Mother-Son, don’t ask your son to wear color matched tennis outfits! Diane and Matt will be playing in the USTA National Father-Daughter, Mother-Son Hardcourts from June 3-5 at the Barnes Tennis Center in San Diego. Think that you might want to try playing mixed doubles with one of your children? Let us know what you think about this blog post on our Facebook Page! Have ideas for future blog posts? Let us know! In recent years you may have been at the tennis courts and noticed your local teaching professional using different colored tennis balls. Some of them may have been orange and some may have been red. The red balls even look a little bit bigger, or they may be foam. You also may have noticed these new lines inside the standard court at some facilities. Sometimes these lines have been permanently painted, or sometimes you may see someone laying down blue painters tape. All these are signs of the latest movement in 10 and Under Tennis. The goal of the new format is two-fold. The first goal is to get kids rallying the ball back and forth playing points as well as matches with each other in a shorter period of time. The second goal of the program is development. We are now able to get kids hitting with proper strokes at a much younger age than ever before. It is not uncommon now to see kids as young as 6 or 7 hitting topspin forehands and backhands. Also along these same lines, kids are now able to learn tennis tactics and strategies at much younger ages. The Quickstart play format is required for use in the 10 and Under age divisions in 2011. The court is 60 feet long as opposed to the standard 78 feet. These divisions will also be using the orange ball. The orange ball is rated at 50% less compression than the standard yellow ball. Another change is the length of the racquet. When playing in a sanctioned tournament, the maximum length of the racquet for 10 and Under is 25". Tournaments will also use a modified scoring method. All 10 and Under divisions will play best 2 out of 3 short sets with a 7 point tiebreaker for the third set. Short sets are played to four games instead of the standard 6 game set. The guidelines for the 8 and Under divisions are different. Tournaments will use courts that are 36 feet long. They will also be playing over the smaller nets and using racquets not to exceed 23". The 8 and Under divisions will use red balls that are rated at 75% less compression than a standard yellow ball. The scoring format will be best of three games to seven points. All of this information may be found on the USTA SC website. It is very important that we here in SC educate everyone on this new format. The USTA SC Tennis Professionals Committee will host a 10 and Under On-Court Workshop for tennis professionals, parents, and recreational coaches on Sunday May 15th from 10 AM - 3:30 PM. The goal of the workshop is to expand the knowledge of anyone that will be involved with 10 and Under Tennis. The program will feature an on court presentation from PTR and USPTA Master Professional and USTA 10 and Under Master Trainer Jorge Andrew. He will be presenting "The Greatest Drills and Games for the Kids 10 and Under." Lunch will be served to all those attending. Following lunch will be a second presentation led by the Chairman of USTA Southern High Performance Committee, Mark Smith. He will be presenting "High Performance Training for the Kids 10 and Under." The final portion of the day will be highlighted with a "Drill Exchange" presented by all members of the USTA SC Tennis Professionals Committee. There will also be merchandise raffled off throughout the day that has all been donated by the following sponsors: USTA SC, Dunlop, Head, Wilson, and Gamma. The cost for the event is $10 for all PTR and USPTA members if registered by May 7th. All other participants will be $15 if registered by May 7th. If registering after May 7th please add $5 to all fees. The registration form can be found here. For more information and to view videos of the Quickstart format please visit www.10andundertennis.com. I was a catalyst for change in my small rural community of St. George, an experience that has been both exhilarating and frustrating. While my efforts yielded amazing results, it’s the ups and downs of the journey that I cherish most. This two-year project stimulated residents from all corners of our town to focus on the same goal of bringing tennis to the children of St. George. While the dream began with me, I would never have succeeded were it not for the overwhelming support of the community. Early on, there was nothing tangible for them to hold onto except the passion of an eccentric retiree who had recently relocated from New York with her husband to build their dream home in the beautiful low country of South Carolina. 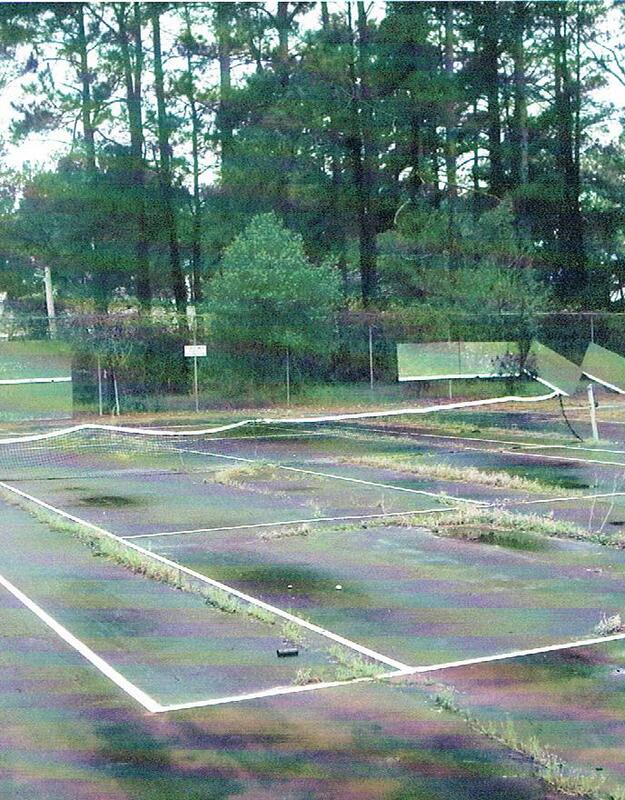 While driving along Park Street several years ago, I noticed that the tennis courts across from the St George Middle School were in terrible disrepair. They didn’t look like they had been used in a long time. Why hadn’t they been maintained? Who was responsible for the courts and how could I contact them? This was in 2008 and was the beginning of my quest for information on the courts. To my dismay I received very little positive information on the courts. There seemed to be very little concern about the condition of this derelict courts. I personally wanted to play tennis closer to home because at that time I was traveling to The Charleston Tennis Center to play. But more importantly, why were the middle school children not being given the opportunity to learn and play tennis on courts right across the street? I remembered how much my son enjoyed playing tennis when he was in middle school. This life long sport has served him well. It helped to enhance his character through building discipline, confidence and independent thinking. Surely I knew that I had to introduce tennis to these young minds. I knew that I had to do something to change the current state of apathy regarding the courts. I remembered that back in New York, Mayor David Dinkins, a tennis enthusiast, had supported the idea of building the Arthur Ashe Stadium and expanding it into the Billy Jean King Tennis Center. Using Mayor Dinkins as a role model, I called for an appointment with our Mayor Anne Johnston. She received me graciously and I began to explain the project I had in mind and requested her advice and assistance. She suggested that I closely examine the area with the Town Park Supervisor and Council Woman Clarine Barton. We found the condition of the grounds, the building housing the rest rooms and storage room and the tennis courts appalling. This was an unacceptable blight in our community. How do we move forward and change this to an asset? I felt depressed and tearful. But then Council Woman Barton whispered: "We can change this." She encouraged me to attend the next town council meeting and plead my case. With hard work and help from many hands, the wheels began to turn toward change. Mayor Johnston, County Councilman Willie Davis, the Loud Leadership Program, Dorchester School District #4 and the St George Rotary Club supported this effort to bring tennis back to St George. Soon the dream of introducing tennis to St George Middle School extended to the entire town. 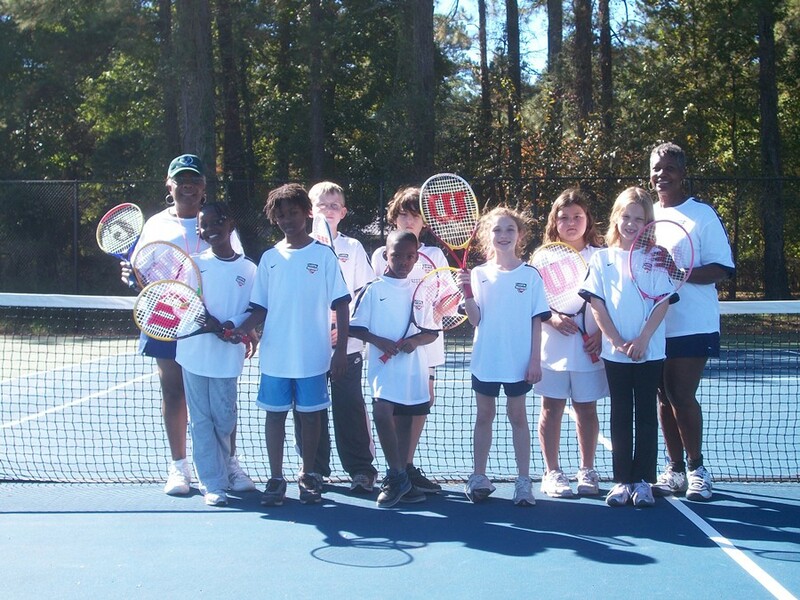 April 2009 and 2010 the After School Program children enjoyed a professional tennis tournament at Family Circle Cup. Their excitement infected everyone that they shared the experience with. The area that I had cringed at two years ago is now a place of beauty. I invite you to visit The St George Tennis Courts. You will see children ages 6 years thru 17 years learning tennis from our Jr. Team Tennis League volunteer coaches. This is our first season to have a USTA Junior Team Tennis league. And now our young adults and seniors can have friendly tennis matches right in our own back yard. By the way Dr Byron and Mr. Allen Brownlee demonstrated how proud they are of the new courts. They invited other players from outside of St George to come play on our courts. I can see a light at the end of the tunnel. But there is still more needed to complete the picture: benches on the courts for players to rest upon, a drinking fountain, a shade awning from the building for waiting players and the children who partake in the Summer Lunch Program which we partnered with last year. Together we have risen above it all. This is no longer my personal dream. We now have a tennis committee consisting of eight members: Beth Tyner, Peggy Carn, Mary Thomas, Allen Brownlee, Dr Butch Byron, Sandra Chzasz, Barbara Jordan, Council Woman Clarine Barton and myself. The committee sets rules and regulations and monitors court use. I can now truly say: "Some people see things as they are and say why? Others see things as they never were and say why not?" The 2011 Family Circle Cup is now less than 30 days away. You can feel the anticipation increase daily listening to the members of the club talk, as well as watching the stress level of our staff rise. This will be the 11th year that the tournament has been in Charleston, and I have been with the Cup since it moved here from Hilton Head Island. With each passing year, you would think that I would get used to all the hectic happenings in the lead up to the event, but trust, me there is never a dull moment. Each year, the facility must transition from a thriving tennis club to a small tented city to accommodate the Family Circle Cup tournament. This means that the facility must close for approximately 2.5 weeks for set up, the actual event, and finally the breakdown. Our membership takes this time off in stride, and the facility works very closely with the members to accommodate their needs. Planning for the for the Family Circle Cup is a 12-month process that begins immediately following the conclusion of the tournament each year, but when were down to the final 30-day window, all of our preparation turns into action! The staff moves into overdrive at this point, with everyone working six to seven days a week. Special tournament operation days are scheduled for all staff, after work hours and on weekends, to help with the physical transformation of the 32-acre site. Each staff members brings their own area of expertise to the table, and my specialty happens to be painting. When you walk the grounds in early March, you will notice that everything has just received a fresh coat of paint. Most members and spectators are not aware that we manufacture over 95% of all tournament signage in-house. This is a huge undertaking, and takes several of our staff members a tremendous amount of time to accomplish this task. Even though the staff puts in a lot of hours during the lead-up to the Cup, it is a great time to bond with new staff members, as well as the interns who spend their entire spring semester with us. This is when you start to see the site transform from a club to a small city, and we subcontract several vendors each year to help with this process. Bleacher seating for our outer match courts begins to arrive, with the most visible being on Althea Gibson Club Court, directly behind the Family Circle Tennis Center’s Clubhouse. After the bleachers are in, you will begin to see large tents that seem to pop up overnight, including our Merchandise Tent, Food Court, and Media Center, all of which are hard-sided structures that give a more permanent appearance to the event and have climate controlled interiors. All tents under 20’ x 20’ go in next, and these are typically soft-sided tents, used on Sponsor Row and Match Point Market. The noise level really begins to increase as these structures are built, but our members take it in stride and continue to play their matches. All of them are very aware that the tournament is just around the corner, and they are preparing to see some great tennis. Most of the infrastructure is in place, and we begin installing the final touches such as carpeting and furniture, which is always a lengthy process. There are so many things going each day at this point in time, and it would be impossible to list them all, so I want to share just a few of them with you. It will take over 500 volunteers to make the tournament run smoothly. They are the backbone of the event and are on the front lines dealing with over 90,000 spectators that will come through the turn-stiles. A whole day is set aside for "uniform pickup." Who helps organize uniform pick up, of course more volunteers! We cannot thank them enough for their efforts. The court maintenance staff is working extremely hard, not only on the five match play courts, but also all the practice courts. It is imperative that all courts are playing similarly, because the professionals want to practice in match conditions.. One of the added benefits to being a member at Family Circle Tennis Center is that all courts receive a tremendous amount of work prior to the tournament, and the members also continue to get the benefit of the perfect court conditions after the event. All staff members are working hard in their own respective areas at this point. Vendors and sponsors start to arrive in droves to get their particular areas set up to their liking. The Family Circle Tennis Center closes for final preparations. The Pro Shop becomes the player dining area, as well as check in for the pros and their coaches. The second floor is set aside for medical doctors and trainers, as well as an additional lounge area for players. Several players will begin to arrive and start preparing for the 2-day qualifier. The Merchandise Tent that so many of you frequent each year is run by a company based out of Atlanta that we hire to provide all the logoed and non-logoed apparel. They will arrive on the Monday prior to the start of the event, and begin loading in all of the tennis product that has been arriving daily from UPS and Fedex (we are on a first name basis with all the drivers by now). This tent is over 4000 square feet, and it’s a major task to turn it into what I call "Disney World for the tennis player who likes to shop". Landscapers will be crawling all over the site, sprucing up trees, bushes, and planting new flowers. Spring is in the air and the tournament is about to begin!! Rob Eppelsheimer is the Director of Facilities and Tennis Development at the Family Circle Tennis Center, a place that he has called home since November 2000. Rob has worked in the tennis industry for over 25 years and is a well-known personality throughout the region, the state and the Southern section. This last year, Rob served as an integral member of the team that prepared Charleston’s application for the "Best Tennis Town" competition, a competition that Charleston won. Interested in Playing College Tennis? Playing on center court at one of the Grand Slams is every serious tennis player’s dream. But except for a very few, it’s just a dream. Another dream might be to play the deciding match at the NCAA Division 1 National Championships, but even that is still a dream that few will experience. By now, you may be thinking this guy is thrashing my dreams of being a big time pro tennis player or NCAA D1 champion. On the contrary, I’d like to explain a bit about playing college tennis and provide you with a checklist to get you pointed in the right direction, if this is your dream. *Division I Ivy League Conference does not offer any athletic scholarships. This junior college division has the most opportunities for state and sectional ranked players, and is a very competitive division that few prospective college players consider seriously. There are a total of 52 men’s programs and 64 women’s programs in this division offering scholarships. So now that you understand a bit more about where the scholarships are, how realistic is it that you could earn one of them? Well, it depends. 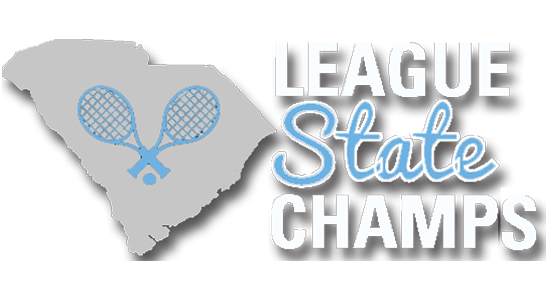 If you are ranked in the top ten in South Carolina, and you play high school tennis, you are not going to have any big time program knocking on your door. And if you do you do, you know someone who knows someone! You could play at a small D1 or really strong D2 program on limited athletic scholarship. That’s why it’s very important to study hard and make good grades. Most small private or even state supported schools have tons of academic money for in- state athletes, so hit the books as much as the court. If you are a junior player ranked outside the top ten in the state and play high school tennis most D1 and strong D2 programs won’t have you on the radar. So your best bet is for your coach to talk to the coaches of your preferred college to see if they have any walk on spots or limited tennis scholarship available. Here again it’s very important to have strong academics to help sway a coach to take you on, because at least you will contribute to the team’s GPA. 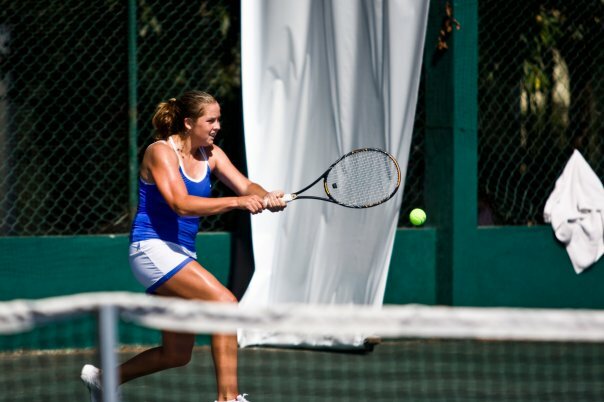 The third type of junior player is the one that plays high school tennis but has limited tournament play. This person probably has no clue how college tennis works and the commitment that it takes in order to play at the collegiate level. I get hundreds of e-mails a year from this type of athlete and I’d like to help them but there is just no way. This player needs to pick a school of interest and try to walk on or play club tennis. · Early in high school, refer to the publications, USTA Guide to Tennis on College and The Guide to Collegiate Information Sessions, Showcases and Forums. Both can be found on the college tennis section of the USTA website. Both are found in the Quick Links section. · Familiarize yourself with the NCAA Eligibility and Recruiting Guidelines. The NCAA has made significant changes made in student eligibility procedures, so be sure that you are very familiar with the recruiting process and guidelines at www.eligibilitycenter.org. You can also find the NCAA publication, Guide for the College-Bound Student Athlete here by clicking on "resources", then "US Student", then Guide for College-Bound Student Athletes. · Don’t let your interest in sports negatively impact your grades. Your success in securing a college scholarship may be impacted as much or more by your grades as by your tennis. · Make a plan of action. Decide where you’d like to go to college, what you want to study, and what you want to do after college. Odds are you are not going to earn money from tennis after college, so you need to be sure that your education will help you get a good job. college recruit. Always conduct yourself as if there are college coaches watching, because they may be. Play state and sectional tournaments, and don’t be shy about letting college coaches know what tournaments you will be playing. · Market yourself. No one else can do this better than you, so take the initiative. Send a hand-written letter of introduction to college coaches you are interested in early in high school. Follow up periodically with e-mails. Tell the coach why you would be a good addition to their team and keep the coach apprised of your playing schedule and successes. By getting an early start, you will be knowledgeable, and you will be more successful focusing your time on those colleges that you have the best chance getting into and playing for. And if you don’t make it on the team, you still can have a very successful college tennis career playing Tennis on Campus, the recreational USTA campus tennis program, complete with sectional and national championships. 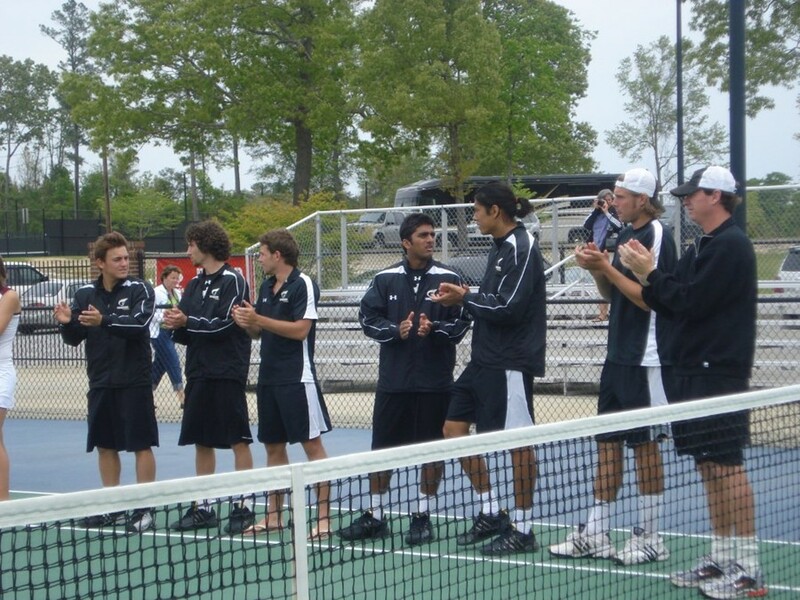 Additional information on this program can be found at http://www.usta.com/Play-Tennis/College-Tennis/College/. 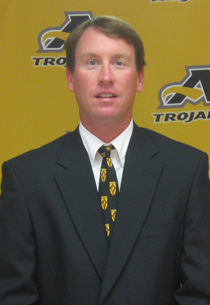 Joey Eskridge is the men’s and women’s tennis coach at Anderson University. A long-time Charleston tennis fixture, Eskridge was the Head Pro at the I’on Club, a founding members of the Charleston Tennis Pro League, and a two time national 5.5 tennis champion. Coach Eskridge can be contacted at jeskridge@andersonuniversity.edu. If you would have asked me any time in the last 14 years what I wanted to do, you would have gotten an immediate answer: be a professional tennis player. This has been my dream since I first saw a tennis court. Picture a 4-year-old girl following her older sister onto a tennis court, dragging a racquet behind her. That was me and the beginning of my love of tennis. I clearly remember the first tournament I played, mostly my disappointment after losing the match. I lost badly and could not stop crying. Not only was the girl much better than me at the time, but she also really took advantage of my inexperience. I’ve come a long way since that day, but each loss over the years has taught me a valuable lesson and helped propel me to the next level. I didn’t play many tournaments as a junior and those I did play were mostly within South Carolina and the Southern section. I didn’t play a national tournament until I was around 14 years old. Tournaments gave me a lot of experience dealing with the pressure of being the top- seeded player, as well as being an underdog fighting for respect. I was so proud of myself when I reached the number 1 state ranking, but I knew there was much more out there that I wanted to accomplish. I started playing international junior events and quickly realized how much more I needed to improve. I went from knowing everyone I played and winning the majority of the time to playing all foreigners and losing a lot. It was a tough, frustrating transition for me, but I soon came to understand that these tough times would prepare me for the beginning of my professional career. Over time, I worked my way up in the junior world rankings and I earned myself a wildcard into my first pro tournament. This was the prize I had been working towards–playing in my first money tournament. At times, it had seemed like such a distant goal, and I wondered if I would ever make it. But here I was at a $10,000 pro event in St. Joseph, Missouri. Let me tell you a little bit about St. Joseph. Eminem was born here, Jesse James was shot here, it was an endpoint for the Pony Express, there is a psychiatric museum, and almost every hour a train would pass through behind my hotel, making some serious noise. Already an unforgettable place that seemed to be stuck in the 1800s, St. Joseph hosted my first professional match that will remain one of my greatest memories. I won 7-6, 6-7, 7-6. During what would seem like a stressful match, I can remember smiling at times because I was so happy to just be playing in a professional tournament. I ended up making the quarterfinals of the tournament, really shocking myself and exceeding expectations. Starting off on such a high note made losing early in the next tournament that much more difficult. I guess you could say I was thrown right into the life of a professional tennis player. You learn to deal with playing really well one week and then the next week finding yourself on court with your C game, fighting your hardest to win any points. I learned quickly that one great tournament doesn’t mean anything because the next week you start over again with everyone else in the first round. Like many things in life, life on the pro tour is a long process, and hoping for immediate results was a mindset that I had to change. Success is all about building up your points and playing at a consistent level week in and week out. I was thankful that I had gone through the same sort of transition in juniors because it was happening all over again. I had worked my way into the top of the juniors and now I was right back on the bottom fighting my way up again. You must learn something from each loss, and never get satisfied with how you are performing. Like Muhammad Ali said, "Only a man who knows what it is like to be defeated can reach down to the bottom of his soul and come up with the extra ounce of power to win when the match is even." I played on the tour for about 10 months before I finally made the decision to actually turn pro. Those ten months brought out every emotion possible. There were really great times where I couldn’t get enough tennis, I was doing really well in tournaments, and loving every minute of it. There were also really bad times, with first round losses, soreness, frustrations, doubts, and injuries. I had gathered tons of experience from all of the tournaments I played and people I had met, and felt that I was competing well. I made the finals of a $50,000 tournament in Indian Harbour, Florida and decided it was time to make the jump. Turning pro probably is a little different than you might expect. It isn’t a great big process with lots of paperwork and official people surrounding you. It basically means not filling out the amateur reimbursement forms and putting a P by my name instead of an A for amateur when I sign into a tournament. And then of course, there is the whole getting paid thing, which is nice! Being on the road week after week takes great amounts of mental toughness. I wish all tournaments were like the grand slams that you see on TV– kids picking up the balls for you, big crowds cheering you on, security on court, autograph signings everywhere you look, cameras watching your every move and so on, but the beginning level of the pro circuit is nothing like this. I’m just a regular person when I travel to my tournaments to play. I’m not flying first class or getting people to drive me around. I’m shopping for the best deals at hotels and cheap flights just like everyone else. Traveling around to different cities can be exhausting but I really do enjoy it. Getting to a tournament a few days early is necessary so I can get used to the courts, balls, elevation, time changes, and the weather. This also gives me some time to sightsee and explore new places. I’ve been fortunate to travel to some pretty cool places and meet a lot of amazing people. Even though the losses, hard work, and being away from home can be tough at times, when I do get the opportunity to play in front of a big crowd or in a grand slam, I realize that everything is worth it and I’m making my dream come true. There have been moments that make me understand exactly why I want to be a professional tennis player so badly. Nothing compares to the moment when someone comes up and asks for my autograph and says they hope to be like me one day, or when your hometown crowd is cheering for you and you can just feel the belief and support every time they clap. Winning matches is great and what I work for everyday, but the best part about professional tennis is the rewards that come off the court. Martina Navratilova said it best, "The moment of victory is much to short to live for that and nothing else." 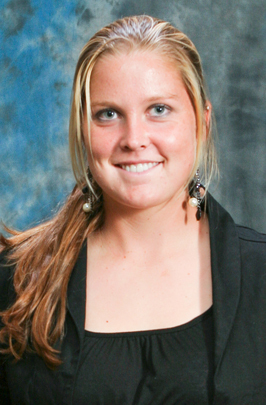 19 year old Shelby Rogers resides and trains in Mount Pleasant, SC and trains with long-time coach Brian Minton. Shelby won the hearts of many tennis fans last year when she played in the main draw of the Family Circle Cup in Charleston. 2010 was a big year for the South Carolina native. She was one of the youngest players to play in the main draw of the US Open, she was a quarterfinalist at the Vancouver pro event, and a finalist in Indian Harbour. And she turned pro. Shelby is off to a great start in 2011, making it to the quarterfinals in Plantation in January. You can stay on top of Shelby’s progress by following her Facebook tournament page. Are you aware that there has been an important change to The Code in 2011? I guess that is really the second question, and the first question should be, "Do you know what The Code is with respect to the rules of tennis? Let me start with the first question, "What is the Code?" No system of rules will cover every specific tennis situation or problem that will arise. For example, we all know that if you are in doubt about whether a ball is in or out, the opponent gets the benefit of the doubt, and the ball should be played as an "in" ball. But you will not find that anywhere in the rules of tennis. There are many similar situations, and that is what led to the writing of The Code, which is a summary of procedures and unwritten rules that custom and tradition dictate that all tennis players should follow. And the underlying premise of The Code is that tennis is a game of courtesy, integrity, and good sportsmanship. The knee jerk reaction of most people (including me when I first heard of the change) is, "Well, that just means that no one will ever correct an out call, even when they know it was wrong." On further reflection, however, I realized that such a knee jerk reaction is the antithesis of what tennis is all about. Yes, we want to win. Yes, people make bad calls. But I firmly believe that the instances of cheating to win and intentionally making bad calls are few and far between. That is because one of the most important facets of tennis is what I mentioned above: it is a game of courtesy, integrity, and good sportsmanship. Thankfully so. Given that the vast majority of tennis matches do not have any officials, you can just imagine the chaos that would reign if it were otherwise. And it is because courtesy, integrity, and good sportsmanship are the fundamental principles of tennis (and also golf, for that matter) that it is such a great game. Perhaps one of the best examples of the integrity of tennis lies with none other than Andy Roddick. In the 2005 Italian Open, he was playing Fernando Verdasco in the round of 16. On match point, the linesman called Verdasco’s second serve "Out." But Roddick thought otherwise and, after checking the mark, conceded the point to Verdasco who went on to win the match. Roddick may have lost the match, but, in the bigger scheme of things, he certainly came away from that day as the big winner by personally upholding the honesty and integrity of the game. After the match, Roddick did not think that he had done anything special, and the reality is that he didn’t. He just did what tennis players do every day around the world—he called the ball honestly, even if it cost him the match. Returning to the revised paragraph 12 of The Code, I have come to the conclusion that people will not hesitate to correct a call even though it now means that they will lose the point. Why? Because this rule is simply an extension of what have always been the underlying principles of the game—courtesy, integrity, and good sportsmanship. Thus, it will be business as usual on the tennis court because tennis players of every ilk, from Andy Roddick to the new 2.5, realize that these principles are essential not just in tennis, but also in life. It really isn’t hard to say, "Out. No, in. Your point." Can you guess the identity of the writer of "Integrity in Tennis"? If you are the first person to correctly identify the writer of this post, you'll win a special prize from the USTA South Carolina. Post your answer on our Facebook page. Hint: This writer is a leader in the tennis community in the Lowcountry. Check out their baby picture on our Facebook page! 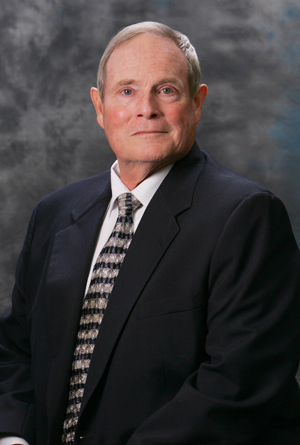 C. David Geier, Jr., M.D. The winter is a time where people often struggle to maintain their exercise routines or play sports such as tennis. While Charleston does not regularly experience below-freezing temperatures, it does become cold enough to deter many avid tennis players, runners, and other athletes. The winter months and their cold temperatures should not provide an excuse not to exercise or play. In addition to helping to improve cardiovascular conditioning, burn calories, and lose weight, exercise during this period can improve overall health. It has been shown that regular exercise can decrease the incidence of common illnesses, such as colds. It has also been suggested that exercise might improve mental health, boost energy, and prevent or reduce depression. Spending hours in the gym to lift weights or repeatedly use treadmills and elliptical machines can become tiresome. However, with appropriate planning and adherence to some basic clothing and exercise principles, almost anyone can get a great workout or tennis match outdoors in cold weather. The main point to remember about clothing for outdoor, cold-weather exercise is to wear layers. One thick, heavy layer can cause the athlete to become too warm, and there is no way to adjust to changing body temperature. Layers allow the athlete to remove a garment or put it back on to adjust to changes in temperature and the body’s heat production. It is thought that a combination of three layers is optimal to prevent heat loss. The innermost layer should consist of polyester fabric that wicks away moisture from the body. Cotton should be avoided since it absorbs sweat and could keep the body wet. The second layer can be thin or heavy depending on the climate and exercise. Usually fleece, down, wool, or synthetic fabrics make good second layers that can be put on or removed as needed. Finally, the outermost layer should be a windproof and waterproof shell. Nylon fabrics such as Gore-Tex and similar materials are sufficiently breathable but repel wind and water. The goal with all layered clothing is to stay warm and prevent heat loss without causing overheating and excessive sweating. Wearing too many layers or clothing that is too thick and warm can be detrimental as well. Running and other forms of strenuous outdoor exercise can make the athlete feel as if it 20-30 warmer. Overdressing can lead to more sweating than the appropriate amount and layers would generate, and that sweating can cause the body to become wet and cold. In general, if dressed with appropriately, one should feel slightly cold when starting to exercise. Layered clothing does a tremendous job at keeping the outdoor athlete warm. However, it is important to protect the head, hands, and feet. To minimize the amount of heat lost, the body decreases blood flow to the hands and feet. Wearing gloves or mittens on the hands and a pair of warm, moisture-wicking socks on the feet will usually protect the extremities. Wearing a hat can decrease the large percentage of body heat that is normally lost from the head in cold weather. Often snow and ice can reflect a tremendous amount of sunlight. One should wear sunglasses to protect eyes against the light and glare. Wearing sunscreen on the face and using lip balm with sunscreen to block ultraviolet rays and prevent sunburn is important in the winter, just as it is in the summer. Snow is not a typical condition in the Charleston area, but it is possible for wet areas of roads and other running surfaces to freeze. Also snow and ice are common in other parts of the country where many people travel during this season. To decrease the chance of slipping and suffering an injury, wearing appropriate shoes in these conditions is critical. Shoes with studs or prominent tread can help on trails or slick roads and sidewalks. Checking shoes for excessive wear and changing to newer shoes if the current ones are worn out is important as well. Athletes often forget to drink enough water or sports drinks in the winter. Body fluids are still lost through sweating and breathing in cold months just as they are in the heat of the summer months. Drinking enough water or sports drinks before and during exercise and replacing fluids after exercise are just as important in the winter. Often putting slightly warm fluids in water bottles before going outside will help keep the fluids from getting too cold to drink. Running experts recommend that it is better to run into the wind at the beginning of a run. Sweat production increases as exercise continues. If the second half of a run is directed into a strong wind, the air flowing past a runner with clothes damp with sweat can feel extremely cold and cause a drop in body temperature. It is probably better to run into the wind at the onset when one has not started to sweat and have the wind at the back later in the run. Serious injury from cold temperatures, such as hypothermia and frostbite, are not common in this area. However, athletes must recognize the signs of these conditions and prevent them. Loss of feeling, tingling, or loss or color in the face, hands, fingers, and toes are signs that frostbite could be developing. Mental status changes such as confusion or disorientation, slurred speech, and uncontrolled shivering can be signs of impending hypothermia. If the athlete is concerned about these types of changes, he or she needs to get into a warmer environment immediately and slowly warm the body and the parts that are affected. 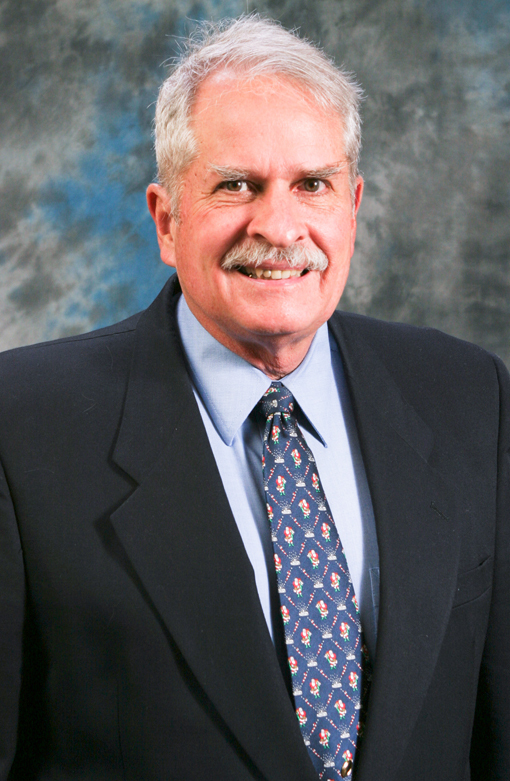 Dr. David Geier is the Director of Sports Medicine at MUSC as well as Assistant Professor of Orthopaedic Surgery. Dr. Geier also publishes a sports blog which can be found at his website, www.drdavidgeier.com where you will find more information on all types of sports injuries. You can also follow him on Twitter at www.twitter.com/drdavidgeier or on Facebook at www.facebook.com/drdavidgeier. Want to comment on this blog post? Visit our facebook page and let us know what you think! Welcome to the inaugural post of USTA SCoop, the insider’s guide to tennis in the Palmetto State. We’re excited about the debut of the new USTA-SC blog and hope you will enjoy reading it. South Carolina has one of the largest and most active USTA memberships in the nation and, despite our growth into a tennis powerhouse, we want to maintain the close fellowship of our South Carolina tennis community. We hope that new website features like USTA SCoop will enable us to build a stronger online relationship with and between our members. Contributors to USTA SCoop will come from all walks of life, and will all share a love for the sport of tennis. A view inside the pro tour, a coach’s thoughts on what it takes to play college tennis, tips on avoiding winter sports injuries and a USTA official’s experiences on the road and at some of the top tournaments are just a few of the topics you’ll see in the upcoming months. As we begin the new year, and the new decade, we hope to make the USTA-SC website a more valuable, easy-to-use resource for everything tennis. From our new blog, USTA SCoop to our online USTA-SC Yearbook, to tennis news updates from around the state on Facebook, to quick tennis tips and news alerts on Twitter, we’re working hard to keep you up to date on everything tennis in South Carolina! South Carolina has one of the most dynamic tennis communities in the nation, and with your continuing participation, we can become even stronger. Enjoy the new and expanded features of our website. Use them to improve your game and to help us grow our sport. Come back often, and let us know how you think we are doing. Wishing you a great year on the courts! Check out the 2011 Jr. Team Tennis Championships!